Decentralized estimation representes an important aspect of decentralized systems. Because various nodes within the system may not have access to all measurements within the system, the individual estimates will be suboptimal. In a perfect world there would exist a means to combine the estimates from all of the nodes into a single estimate which makes use of all system measurements and is optimal. Difficulty arises because some measurements may be used by more than one node leading the estimates from those nodes to be correlated. An example of such a system is the spacecraft attitude estimator shown. Because each extended Kalman filter (EKF) makes use of a common gyro measurement the two estimates will be correlated. The problem to be solved is how can we efficiently and consistently fuse the individual estimates from each EKF to obtain the best possible estimate? An elegant solution for the fusion of estimates with unknown correlations is the Covariance Intersection (CI) algorithm [Julier and Uhlmann, 1997]. As the name suggests, the CI algorithm is routed in the fiundamentals of Gaussian intersection. Appreciation for the CI algorithm is gained by considering the fusion of two estimates in 2D. In 2D the covariance of a Gaussian random variable can be interpreted as an ellipse. If multiple estimates of the same 2D state vector are available, their covariance ellipses will intersect as shown. The CI algorithm expresses the covariance of the fused estimate as the smallest covariance ellipse which contains all of the intersection of the two individual covariances. Depending on the confidence in each estimate or a desired final statistic, each individual covariance can be weighted by a scalar value which leads the CI algorithm to include a family of solutions as shown. Another elegant property of the CI algorithm is that, while being derived from a geometric viewpoint, it can also be derived from a matrix- and scalar-weighted optimization problem. This property allows the CI algorithm to be extended to the fusion of higher dimensional state vectors and an arbitrary number of estimates. While the CI algorithm provides a meaningful and elegant solution for the problem of fusion under unknown correlations, the fusion of attitude states is not trivial. The main difficulty with fusing attitude estimates is the choice of attitude parametrization. The traditional attitude parametrization of choice for space applications, the quaternion, must satisfy a unit norm constraint. This leads the CI fused estimate to be the solution of a constrained optimization problem. For state vectors including only a single quaternion there are several solutions to the resulting optimization problem. Julier, S. J., and Uhlmann, J., K., "A Non-divergent Estimation Algorithm in the Presence of Unknown Correlations," American Control Conference, Albuquerque, NM, IEEE Publications, Piscataway, NJ, June 1997, pp. 2369 - 2373. Julier, S. J., and Uhlmann, J., K., General Decentralized Data Fusion with Covariance Intersection (CI) in Handbook of Multisensor Data Fusion. CRC Press. Boca Raton, FL., 2001, Chap. 12. Shuster, M. D., "A Survey of Attitude Representations," Journal of the Astronautical Sciences, Vol. 41, No. 4, Oct.-Dec. 1993, pp. 439-517. 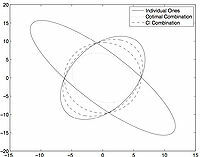 Crassidis, J. L., Cheng, Y., Nebelecky, C. K., and Fosbury, A. M., “Decentralized Attitude Estimation Using a Quaternion Covariance Intersection Approach”, Journal of the Astronautical Sciences, Vol. 57, Nos. 1& 2, Jan.-June 2009, pp. 113 – 128. Nebelecky, C. K., Crassidis, J. L., Fosbury, A. M., and Cheng, Y., “Efficient Covariance Intersection of Attitude Estimates Using a Local-Error Representation”, Journal of Guidance, Control, and Dynamics Vol. 35, No. 2, Mar.-Apr. 2012, pp 692 –696. Nebelecky, C. K., Crassidis, J. L., Banas, W. D., Cheng, Y., and Fosbury, A. M., “Decentralized Relative Attitude Estimation for Three-Spacecraft Formation Flying Applications”, AIAA Guidance, Navigation and Control Conference AIAA Paper 2009-6313, Chicago, IL, Aug. 2009.